I bought the lithium chloride specifically for it's methanol flame coloring capability. Strontium nitrate produces red as well. My two faves are lithium for cherry red and boric acid for the ghostly green. I'll have to give copper a try. Is there some specific copper salt you would recommend e.g. copper chloride? Would the copper salt vibrate blue or green? A bright blue would be awesome. For those who are unfamiliar with what we are talking about, methanol is the only liquid hydrocarbon that acts like water in that it can dissolve ionic metal salts. Methanol is also very simple and tends to burn completely and does not release any excess carbon atoms. The type of salt dissolved in the methanol will vibrate in it's intrinsic spectrographic color within the methanol flame. Carbon vibrates bright yellow, so it is very important that no carbon based substances are allowed to contaminate the methanol/salt mix. Any carbon contamination will make the flame burn bright yellow and swamp out any other desired color. The powered titanium you speak of is probably titanium sponge. Titanium sponge is the raw titanium metal produced during the electrolysis process to refine the metal. And yeah, it burns very hot! Now I have heard of solid magnesium catching fire, but not titanium, or aluminum for that matter. Aluminum flakes and powder are used extensively in fireworks as well. Titanium was the metal used for the SR-71 spy plane. So I'm hoping it will not burst into flames. At least not right away. Once the airframe is 100 feet in the air, then it's ok . Thanks for the links by the way. I hope to have the TiJet tig welded up in the next week or two. I'll keep all of you posted. I was looking up the solubility of lithium chloride and it's way more than ordinary table salt according to the properties chart on the right side of these pages, which is kind of nice for that intense red color. I bought some potable 190 proof Everclear awhile back to run some small jam jars in the house briefly thinking the odor would be less objectionable than methanol. You get incomplete combustion with jam jars and you can smell formaldehyde as well as the methanol vapors. Ethanol is not much better, there's an odor of acetaldehyde which is not really good to breathe either. Apparently LiCl is soluble in ethanol too, but to a lesser extent and with Everclear there's 5% water which might help slightly. The denatured alcohol you buy is often roughly a 50/50 mix of methanol and ethanol. But methanol is better for not interfering with the colorants as you mentioned. "Cleans glass and is used as a fuel for marine stoves"
Found this on boric acid solubility. Very informative forum and I've read as much as possible. For simple engine, there's a lot to soak in. 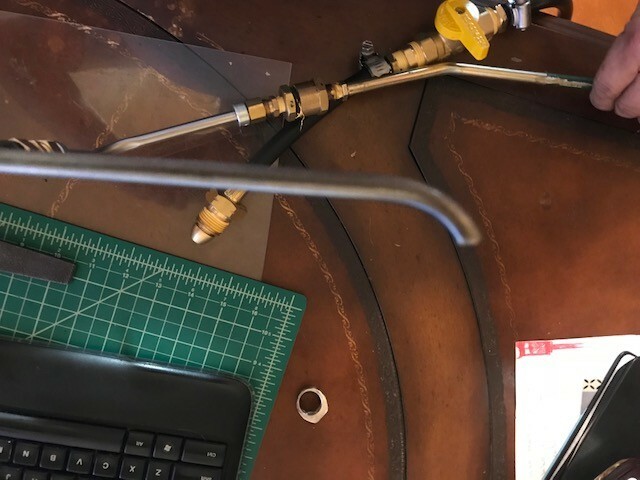 I built the No-Weld plumbing parts pulsejet Mike Everman provided plans for. Having difficulty getting it to stop spitting orange flames and make small purring, gurgling noises. I'd like to ask anyone of the obviously talented experts on this forum to verify my build as describe here, and then weigh in on my fuel amount question. Because Mike's design is depicted many times, I will describe it briefly. If photos help I'll add them on request, but I didn't want to bulk this up any more than I already have below. -Fuel is propane from a 20 gallon tank. 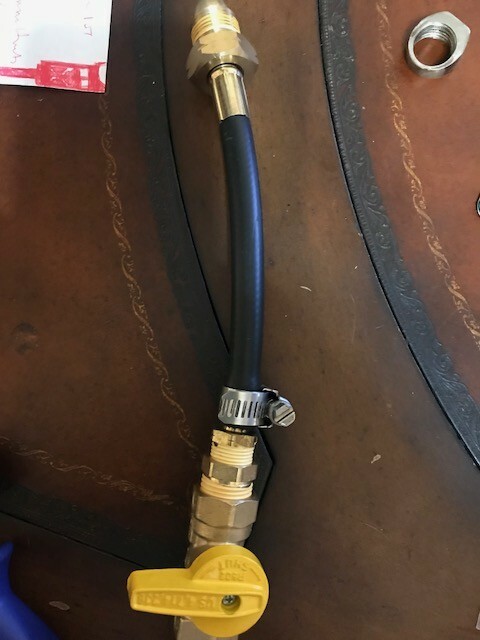 I bought a harbor freight propane torch which has a trigger and a needle valve wheel on it. It has what I take to be a high pressure orifice on it, and it has the requisite 1"-20 LH Throwaway Cylinder thread pattern to connect to the tank valve. I spliced a brass gas ball-valve into the hose of this torch. every thing is sealed up with yellow thread tape and torqued down nice and tight, no leaks. At the end of the harbor freight torch, I use a couple of brass couplers to get me to a compression fitting to first a 5/16" tube that is about 8" long and makes a nice bend, and then another compression fitting to connect the final 1/4" tube which is about 10" long, and has a nice smooth 90 degree bend in it to put the end of the pipe at the inside of the CC right after the 2"x3/4" reduction fitting. The very last 1/2 inch of this tube is canted up so the gas will come up right in the middle. The set up of the various valves is as follows: tank's valve is fully open, harbor freight torch trigger is fully pressed, and it's needle valve fully open. The in-line brass ball valve is closed until ready to start. 1. Anybody detect an error in how I have described the set up? Or some detail I left out that I should verify? 2. Reading Mike's start up procedure, my approach to fuel is to add a small amount for lighting, trying to get it to run. However, it also seems like some folks effectively dump more fuel than I am into the CC to get their jets to start. My concern is having some kind of detonation from too much fuel. So does it sound like I'm being too conservative on fuel? I'm reluctant to goose the fuel too high at start, but I don't know what I don't know. Can you post a couple of pics of your rig. I'd like to see how your fuel is actually entering the system. The only fuel tube I got to work on that was 1/8" dia copper, with a little bend at the end (or was it nipped at 45?) murky memory, have to read my own thread on it. Did you do the rounding of the intake edge, making the flare? Till you heat it up some, less air and less fuel until you get some really big bangs, then you are adding both slowly. move the air around until it is popping regularly. Sure, Mike. I always take a little time regaining skills for uploading pics, so hopefully this works first time. If not I'll jump back in and edit it. First is pic of the Fuel Tank connection hose with the gas ball valve spliced in. This is a 350 PSI rated propane gas hose w a 3/8" ID, held onto hose barbs with hose clamps. All the brass thread connections apart from compression fittings are sealed with gas tape. 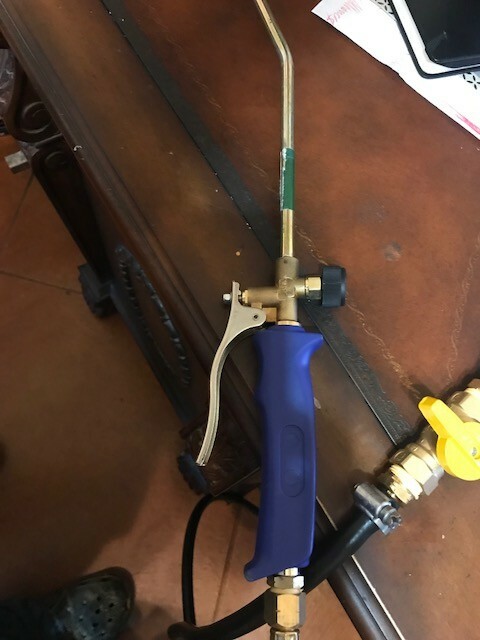 Then the gas torch connects to stainless steel tubing via compression fittings. Yep I beveled the intake opening and at the CC, and the exhaust tube at the CC and the exit. I rounded them using files and then finished with sand paper drums on an air tool. Re the tubing I have surplus copper tubing that is 3/16 OD. I could add that into the final end of the tube using a compression fitting reducer. let me know what you think. I see what I had was a 3/32" fuel stinger, bent and pinched a little. You really want a little exit hole for the fuel injector, like 1mm is the upper end, and there are several positions and angles that work and many that don't. Thanks! I remember reading the tutorial because I recognize the description of playing with the positioning of the fuel injector and the growling vs gravelly noise. I appreciate that you clearly talk about low fuel pressure because I have a colleague who is telling me I should basically dump a ton of fuel in to start it. I really appreciate the details in the stinger which I had not noticed before. I will try this over the next few days and hopefully advance farther. Perhaps my next question will be how to avoid being arrested for noise/public disturbance. Mike, I have now copied your fuel stinger using 1/16 ID copper tubing, which is about 1/8 OD. 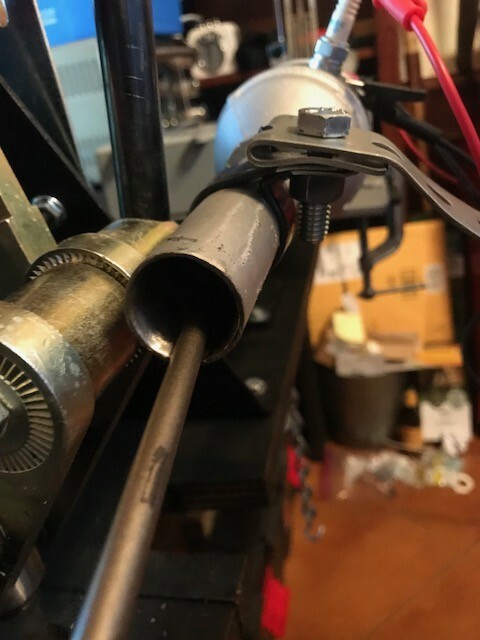 I narrowed the orifice by putting a small pin-vise drill in the hole and squeezing the tube end around the drill with pliers. 1/16 would be about 1.6mm, I think its now a little under 1 mm. 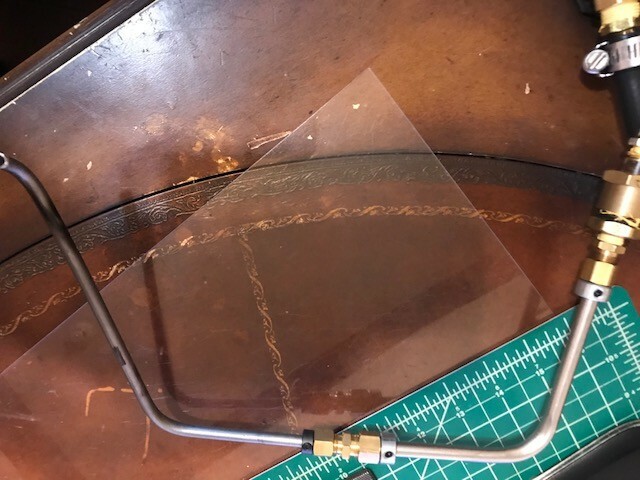 The copper tube has that kink in it to help hold it in place on the intake tubing, and then runs about 12 inches away where it connects to 1/4 stainless steel via a compression fitting. I will leak test it all tonight and am not above JB Welding every joint. I will probably try to light it again tonight. Fingers crossed. -I still have most of the hair on my right arm - I was encouraged to wear a welding glove. 2. I tried lighting the stinger outside and moving it into the intake. it dies about 2-3 inches in, which I assume is mix is too rich/oxygen starvation. Tried cutting the fuel down, but again, maybe just not a fine enough control. 3. I can also light it with the tip inside the intake, up to about 2-3 inches, but not with it inserted to the point where the intake transitions to the combustion chamber bell. I can only light it this way with a lighter or propane torch. 4. My BBQ grill and spark plug ignition is delivering an unpleasant shock to the finger tip, and the spark can be seen about 2mm long when I look in the intake. I really would think that would be enough, but it will not ignite from this ignition. Maybe still too much propane per oxygen for the amount of spark? 5. I tried priming it with a good volume of fresh air each time, and I tried both a hair drier on hi, a hair drier on low, and my air compressor nozzle at 60 PSI as far as different air pressures. I tried each of these at various positions near and farther from the intake. In any case if I was closer than about 12 inches the flame blew out. I am beginning to see why you guys are addicted to these engines. It was fun, even despite failure in the 95F+ Texas evening at 8 PM. Ultimately we quit after mosquitoes had taken their fair share of blood, and I'm nursing a bourbon. If I could just get it to pop I would be addicted enough to persevere. Ah, a trickle of everything is needed until you start getting BANG! Everything open but the needle valve. Slowly crack that, and i mean minimal. Trickle air, like a badger fart. Every pop in the pulsejet cycle, when you actually get a cycle, is a small amount of fuel. You need to get some good ol cannon blasts to appreciate how you will sneak up on a sustaining cycle. Too much fuel makes for “rich extinction”. As you sloooowly turn up air feed, there is always a fuel level that will give you some action, but you have to micro adjust up and down to find it. When you get good at it, you will be able to dial them up together rapidly, but this is always going to be a finicky motor. 10-4. I’m also going to eliminate spark as a variable by using a sparkler. this is how addiction begins.